Remember those nights in Hagerstown, Maryland — back in the very late ’70s — when a small local band named The Shooze (which later turned into The Generators) rocked that little city? Maybe not, but you’ve all surely heard about the next name used… the goddamn Kix band. To be honest with you, all I remember about this region is the atomic accident in Harrisburg at Three Mile Island on March 28, 1979. Maybe that’s the reason why so many musicians from that area created high-energy radioactive-hot bands… like Kix. Kix was, and always has been, blue jeans, black leather jackets, massive hair and solid rocking hard music in the ‘stomp and grind’ vein — very cool boys that got a record deal with Atlantic Records and released Kix in 1981 and Cool Kids in 1983. With 1985’s Midnight Dynamite Kix finally got some recognition before the follow-up Blow My Fuse, a make-it or break-it album, became a smash hit thanks to the ballad “Don’t Close Your Eyes”, which hit both the MTV and Billboard charts. The band’s most successful release was followed by an arena tour through the U.S. with Ratt. Then came the electrifying Hot Wire in 1991 before Kix said goodbye with 1995’s Show Business, an album which wasn’t that bad, but the times were tough for hard rock in general. Upon their break-up the members of Kix scattered — singer Steve Whiteman formed Funny Money while the others played in smaller projects and/or disappeared. Guitarist Brian ‘Damage’ Forsythe later resurfaced in Rhino Bucket and these days lives in Los Angeles with Janiss Garza (writer for RIP magazine and co-author of Lemmy), loves his pets (he has a day job at an animal veterinary clinic) and recently toured Europe with Rhino Bucket in support of their new CD Who’s Got Mine. 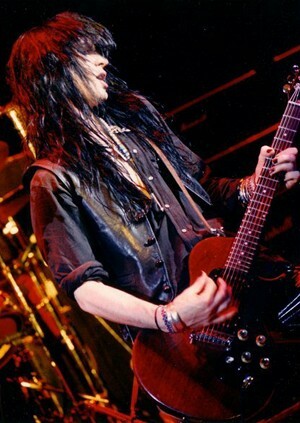 One of my guitar heroes from that period, Brian took a little time to talk to Sleaze Roxx after playing in Berlin, Germany. Sleaze Roxx: How did you get started with music… did you have any idols? Brian ‘Damage’ Forsythe: Oh yes, definitely The Beatles. I was about 6 years old and saw The Beatles on the Ed Sullivan Show and I thought, ‘wow, that’s what I want to do’. Standing in front of the mirror I was like all the kids… with a tennis racket in my hands I was playing The Beatles (laughs). Then my older brother showed me a couple of tunes from Bob Dylan that I learned, and it went on and on. Then I got out of high school I played in several cover bands over the next few years and discovered music like ZZ Top, Aerosmith, Foghat, Robin Trower and many others — and of course The Rolling Stones. The first time we (the band that would later become Kix) got together was December 1977. Ronnie Younkins asked me to form an original band performing original songs with his friend Donnie Purnell, and then we played all the time in our home area. One day we had a showcase for Atlantic Records and I never thought about it much — it just happened that they liked us and we had a record deal. But it didn’t really change that much, I mean we were playing our music all around, we didn’t think too much and played our nuts off. Sleaze Roxx: Regarding Kix, which three songs are you most proud of? Brian ‘Damage’ Forsythe: I like “Cold Blood”, especially playing it live as it always sounds good on any night. “Pants On Fire (Liar, Liar)” is another cool tune — or maybe “Hee Bee Jee Bee Crush”. Sleaze Roxx: With Kix you worked with some of the most famous producers in the ’80s. Midnight Dynamite was produced by Beau Hill and Blow My Fuse was handled by Tom Werman. How was it working with legends like them, did that cause any pressure? Brian ‘Damage’ Forsythe: Not really pressure, but they took us as a band to a higher level. The only thing that scared me a bit was when I came to the studio during the Midnight Dynamite sessions and the door was locked. I heard someone playing guitar riffs that I did before and I thought, ‘hey, wait a minute, what’s going on?’ There was another guitar player doing my parts for one song (Mike Slamer, who was brought in by Beau Hill), but it was only for one song. With Tom Werman it was a little more relaxed, he supervised a lot and I like the way he worked with us. I like the mix of that record, Blow My Fuse is very powerful. Sleaze Roxx: If you were transported back in time to the Kix era (1980-1992), what would you do differently? Brian ‘Damage’ Forsythe: I probably would pay more attention to the whole thing — take care for more things and myself. That’s the thing I regret. Sleaze Roxx: What are three of your fondest memories of being in Kix? Brian ‘Damage’ Forsythe: Let’s see. Probably the first big tour, the arena tour with Ratt in the beginning of 1989 — we had never had such a big tour before with our own tour bus and all the things you dream about when you’re in a band, until then we travelled in a Ford van throughout the country. And maybe the day when we did the showcase and the record company guy came to us and asked us about signing a contract. The big things you’ll never forget. Sleaze Roxx: How was a typical day in your life back different than today? Brian ‘Damage’ Forsythe: Oh, back then it was a van, a hotel room, and a gig every night. That’s not so far away from the situation with Rhino Bucket these days (laughs). On tour with Rhino Bucket it’s very show after show, and then we have some days off. We are our own road crew, travel around a lot and have fun. That’s what I’m made for, and you can see it on my Facebook blog. 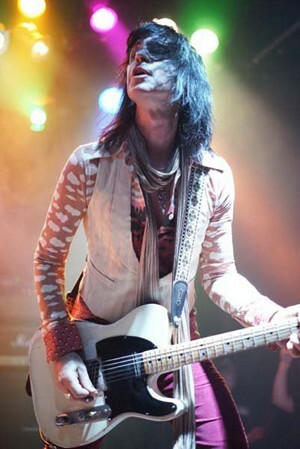 Sleaze Roxx: After the split with Kix in 1993 you were hired as a musician for the Show Business album a year later — in the meantime you lived in Los Angeles while the rest of Kix lived in Maryland. Brian ‘Damage’ Forsythe: Yes, I moved to live constantly in Los Angeles in early 1993, before that I flew out to L.A. once in a month to assemble a new band and the first musicians I ran into to write songs with were Eric Stacy (of Faster Pussycat) and Pat Muzingo (of Junkyard). We formed the Rhythm Slaves and between 1994 and 1998 I played in a variety of bands and also met, for the first time, Reeve Downes and Georg Dolivo of Rhino Bucket. As a musician you have to play and play and play. I mean, the 1990’s were the hardest, it was impossible get some money as the market for hard rock bands was gone. You have to do some day job, even part time, but you have to survive. Sleaze Roxx: You stopped drinking and using drugs in the late ’90s. Since April 1, 1998 you have been living a new life. Brian ‘Damage’ Forsythe: I wanted to stop and I wanted to be sober. That’s the most important thing, doing it for no one else, just doing it for yourself. When I started with Alcoholics Anonymous I thought I could make it first in a group and then on my own. In a group it’s like a spiritual thing and that’s the way it works — give and take from the people. I had only the choice to die, end up in jail or stop — it was the right time back then. When I’m in a club today I don’t have to drink alcohol, and when I see drunk people, I’m over that situation. Sleaze Roxx: What are your future plans? Brian ‘Damage’ Forsythe: With Rhino Bucket, definitely! Recording albums and touring.With Kix it’s more doing a show on a weekend basis — we have a booking agent who books us on shows, we don’t do a show without getting paid. One of the next shows we have is headlining Friday night at the M3 Rock Festival in Columbia, Maryland on May 13. I think it’s great that people want to hear the old ’80s music again, it gives Kix a good excuse to go out andplay shows again. Also a lot of young kids are getting into ’80s music and show up with their parents. During the ’90s this type of musicdisappeared in the USA so I think all these people were waiting for it to return. The cool thing about Kix is we still pretty much look,sound and have the same energy as we did back then — so it’s an extra bonus for the fans!